St. Augustine’s University’s highly decorated track and field coach might well be King T’Challa of his sport. 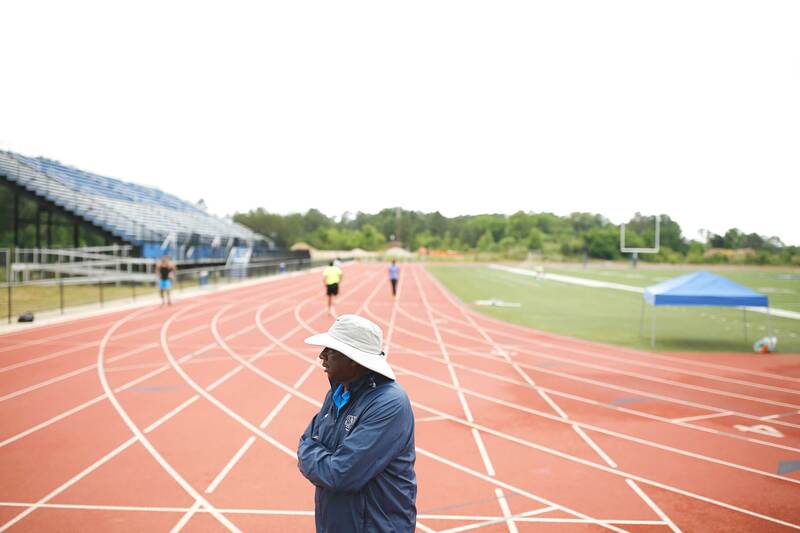 Now in his mid-70s, George Williams is in his 47th year at St. Augustine’s, including 41 as its track coach, and is one of the favorites again to lead his teams to titles when the Division II Outdoor National Championships get underway Thursday at Johnson C. Smith University’s Irwin Belk Complex in Charlotte, North Carolina. Williams and his fourth-ranked women and eighth-ranked men are performing this season with a new outlook, a new long-term goal and a new theme — the latter adopted after they went to see the box-office smash Black Panther. “Our theme,” Williams said, “one person holds their hand out and we tap it three times, then cross our arms,” in the manner of Egyptian pharaohs and West African sculptures. That’s about how long Williams, a former coach of the U.S. Olympic team, and St. Augustine’s have been one of the rulers of Division II track. St. Augustine’s has won 39 NCAA Division II indoor and outdoor championships under Williams, who has the most NCAA track and field titles of any coach, regardless of division. Going into this weekend, Pittsburg State, Texas A&M-Kingsville and Tiffin are the top men’s teams. The top women’s teams are Lincoln (Missouri), West Texas A&M and Pittsburg State. But no one is counting out St. Augustine’s on the men’s or women’s sides. 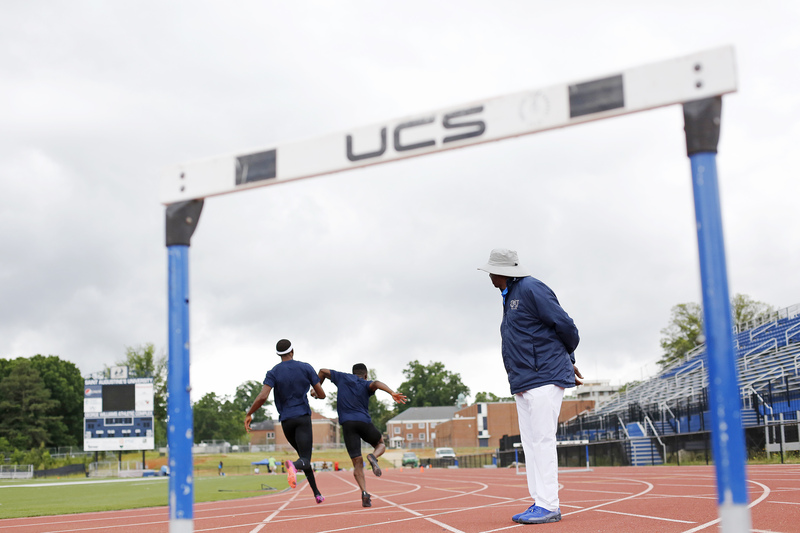 Track and field coach George Williams, right, watches as senior Adrian Kimmons, left, and junior Dontarian Evans work on passing the baton during practice at the George Williams Athletic Complex on the campus of St. Augustine’s University in Raleigh, North Carolina, on May 17. Williams is a coaching legend with 42 years of experience at St. Augustine’s, 39 NCAA Division II national track and field championships and experience with 40 Olympians, including three gold medalists. Next week, Williams will head to Charlotte to try to make his national championship record an even 40. The men’s team has won five straight outdoor national titles (2013-17) and seven of the past nine. The five-peat is the second-longest such streak in Division II outdoor track. This year’s team hopes to stay on pace to catch Williams’ most successful run: From 1989 to 1995, Williams’ men’s teams won seven consecutive outdoor national champions, a streak that tied the mark of Division II consecutive outdoor national championships. In all, Williams’ men have won 16 outdoor titles (second-most in Division II) and had 111 individual outdoor champions (tied for second in Division II). The men have also won 13 men’s indoor championships, tied for the most in Division II. Williams’ women’s teams have also enjoyed periods of dominance: Their four Division II outdoor national titles (1997, 2000, 2001, 2002) are the fourth-most in the division; 47 individual outdoor champions are third-most in Division II; and six women’s indoor national titles are second-most in Division II. Williams remembers some of the details of his title years, but perhaps more vivid are the near misses. A dropped baton in a relay contributed to the 2016 women’s team missing out on the national title by one point (52-51) to Pittsburg State. More memorable, and pleasantly so, was last year’s national title conquest. The Falcons men trailed by two points heading into the final event and won the 4×400 relay — and Williams’ 39th national championship. That puts Williams one title away from his 40th, which he told The Undefeated in 2016 would trigger his retirement. But now the retirement talk is on ice, and Williams says he plans to coach until 2020. So just what keeps Williams going? Such as prominent New York attorney Xavier R. Donaldson (Class of 1990), who was an 800-meter All-American at St. Augustine’s. Such as New York surgeon Michael Weir (‘85), a long jump and triple jump specialist who was also an All-American. Other mentees include Patricia Davis (’86), who is the athletics director at a high school in Florida, and Tanya Rucker, a fire chief in Washington, D.C.
Williams’ scholarship athletes have a 95 percent graduation rate, according to the school’s athletics office. Williams said all of his women’s competitors are honor students at St. Augustine’s. Williams, who headed the 2004 U.S. Olympic track and field program, has coached more than 40 Olympians and three gold medalists, including 2000 4×400-meter champion Antonio Pettigrew, as well as Jerome Young and 4×100 champion Kenny Brokenburr from those same Games. Williams’ more than 150 honors and awards include being named the NCAA Division II National Outdoor Men’s Coach of the Year in 2016 and 2015. In 2014 and 2013, he was the Men’s and Women’s NCAA Division II Coach of the Year. He has similarly excelled as athletic director, a post he assumed after the 1996 Olympics. In 2014 he was named Athletic Director of the Year in the Central Intercollegiate Athletic Association (CIAA), where his teams have won more than 150 track and field and cross country conference championships. Williams and St. Augustine’s are hoping to do as well this weekend as they did the last time they ventured from their Raleigh, North Carolina, campus to compete in a national meet in Charlotte. That was in 2010 when the men’s team won the event, the second championship in their current five-year reign. The Falcons don’t necessarily look like world-beaters when they disembark from their bus: They regularly compete at nationals with seven to eight athletes — against larger school teams that are 19 to 20 strong. The Falcons’ dominance is in the sprints, including relays, and hurdles, which they use to amass points in the meet’s final events, which take place on Saturday. 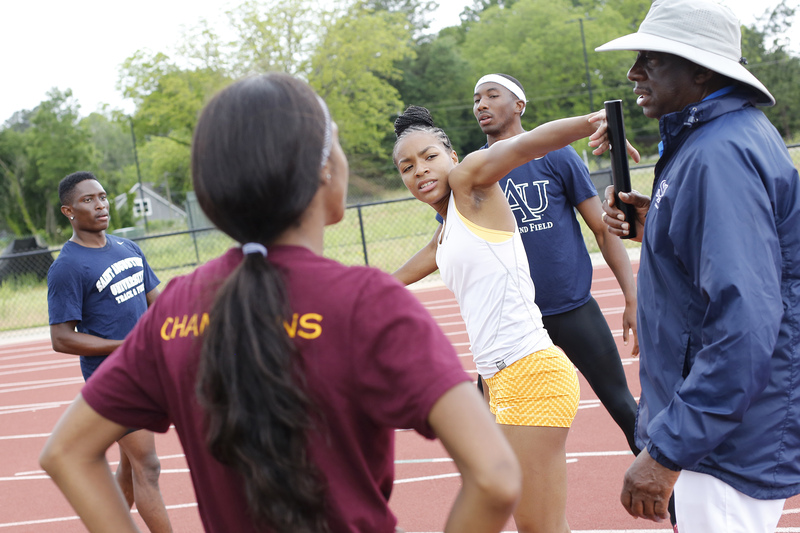 Track and field coach George Williams watches his athletes during practice at the George Williams Athletic Complex on the campus of St. Augustine’s University in Raleigh, North Carolina, on May 17. The Falcons have an eight-man team in Charlotte, including Brandon Valentine-Parris (junior-senior/St. Vincent), named Tuesday as the Atlantic Region Track Athlete of the Year. Valentine-Parris ranks fifth in the 200-meter dash and sixth in the 400 meters and is a member of the fourth-ranked 4×400-meter relay squad and seventh-ranked 4×100 meter relay team. He is the only Falcons team member racing in four events. The team also includes Shaquille Dill (junior/Pembroke, Bermuda), who ranks fourth in the 800-meter run, an event in which he has won a national title. Dill will also compete in the 4×400 relay. Others include Dakarai Hightower (senior/Tacoma, Washington) and Najair Jackson (freshman/Spanish Town, Jamaica), who ranks third in the high jump and javelin. Dill is the CIAA Men’s Runner of the Year, and Jackson is the CIAA Field Athlete of the Year. For his men to hold up the trophy Saturday, Williams said, “It’s going to take a good prayer. “We’ve got some good horses, but sometimes the horses don’t eat oats, they want to eat hay. We have some good athletes, but we’re going to run against some good times. But if we hit on all cylinders, somebody’s going to be in trouble. “When you’ve won five in a row, everybody is looking at you,” Williams said. “We’ve got a good shot in the 800, a good shot in the 4×400 and 4×100, a good shot in the high jump and a good shot in the javelin. St. Augustine’s does not always compete in javelin, but Williams took a chance on Jackson, who moved from Jamaica to Virginia and didn’t compete for two years in high school. More than anything that happens on the track and field, Jackson said that Williams’ greatest feat is creating a welcoming atmosphere. Track and field coach George Williams, right, works with his athletes on handoff technique during practice at the George Williams Athletic Complex on the campus of St. Augustine’s University. Shannon Kalawan (sophomore/Westmoreland, Jamaica) leads the women, who are among the meet’s favorites despite having just five qualifiers. Williams believes it is his best women’s team since 2016, when the team was within a hair of winning it all. Kalawan is top-ranked in the 400-meter hurdles and 400 meters and is a member of the top-ranked 4×400 relay team, which also includes Ade Hunter (senior/Philadelphia), Leah Barker (senior/St. Michael, Barbados) and Amanda Crawford (sophomore/Brooklyn, New York). Just like Valentine-Parris on the men’s side, Kalawan will run in four events: the 400 hurdles, 400 meters and the 4×100 and 4×400 relays. Kalawan’s 56.99 time in the 400 hurdles is the 13th-fastest in Division II history and the ninth-best in all divisions this year. She is also the Atlantic Region Track Athlete of the Year and CIAA Runner of the Year. Magaly Tshipopo (senior/Orleans, France), the CIAA Women’s Field Athlete of the Year, is competing in the long jump, high jump and triple jump. She is sixth nationally in the high jump and eighth in the triple jump. Crawford, ranked eighth, and Hunter, ranked ninth, join Kalawan in the 400 meters to give the Falcons three top-10 competitors. Crawford also runs the 200 meters and 4×100 relay for a total of four events. The women are ranked in the top nine in eight events — No. 1 in three events. Barker, who runs in two relays this weekend after recently earning a degree in business administration, calls it “a privilege to run for Coach Williams.” She believes he can help her achieve her dream of representing Barbados in the Olympics. “Coming from a small country, it would be a privilege just to put our country on the map. Williams and athletes Valentine-Parris and Kalawan were recognized recently by the U.S. Track & Field and Cross Country Coaches Association for their performances during the 2018 outdoor season. Valentine-Parris was named Atlantic Region Men’s Track Athlete of the Year, and Kalawan was chosen Atlantic Region Women’s Track Athlete of the Year. Williams was selected the Atlantic Region Men’s and Women’s Head Coach of the Year. So how did Williams, a former All-CIAA basketball star, become the supreme ruler of track and field? The St. Augustine’s campus does not have mines of vibranium, the rare metal that powers Wakanda. Instead, when Williams became St. Augustine’s head track coach, he mined the brain of coaching legends at other historically black colleges and universities who became his mentors. These include track guru LeRoy T. Walker of North Carolina Central, who became the first black president of the U.S. Olympic Committee, and basketball Hall of Famers Clarence “Big House” Gaines of Winston-Salem State and John B. McClendon Jr., who coached at North Carolina Central, Hampton, Tennessee State and Kentucky State before becoming the first African-American head coach of a predominantly white school (Cleveland State) in 1966. “Every year I would sit down with them at CIAA and pick their brains,” Williams said. He learned how to be successful and build champions from all three. Williams says he would freely share information with today’s young coaches — if only they would ask. Instead, what he encounters most often is a collection of Killmongers, T’Challa’s nemesis in Black Panther. “If you ask him, he will surely tell you. He doesn’t have a problem telling anybody,” she added. “I look up to him like a secondary pop. Even as a high school coach, he would give me guidance on everything. I would see him in recruiting, and I saw him instructing different workshops. “When he talks, people listen; he’s like the EF Hutton of track and field,” she said, referring to an old TV commercial about a brokerage firm. “When he talks, people listen. He’s like the EF Hutton of track and field,” she said, referring to an old TV commercial about a brokerage firm. She said Williams also encouraged her to take on leadership positions in the track and field world. She said Williams also looked over some of her workout schedules for her team members and tutored her to move some things around and to do some things on different days. Latimer said it paid off in the mid- to late 2000s, when one of her athletes beat a St. Augustine’s competitor in the hurdles using workouts and techniques she learned from Williams. A bigger challenge, Latimer says, stands before her, Williams and other coaches today. “Reaching young people, it’s kind of hard,” Latimer said. “They are dealing with something we didn’t have to deal with: social media. When will Williams finally hang up his whistle and retire to the rocking chair? When will he step away to spend more leisure time with his wife, daughter, son-in-law and two grandkids? “That’s God’s will,” he said. “It’s not mine. “When Dr. [LeRoy] Walker stopped coaching track, he was 85. When coach Russell Blunt stopped coaching at [Durham, North Carolina’s] Hillside High School, he was 99. As long as my health is good, I’m here to help,” he said. “I think I can walk farther and run faster than anybody over 70. David R. Squires is a writer, editor and digital journalist who has worked for the New York Times, Detroit Free Press, Cleveland Plain Dealer and St. Petersburg Times. He's also a former editor-in-chief of BlackVoices.com and BVQ magazine, a former Black Enterprise writer and editor and NUTribemagazine.com managing editor.